The Fellowes Powershred 99Ms Micro Cut Shredder is an ideal shredder for offices looking for a powerful and effective shredder. This paper shredder can take up to 14 sheets at a time and shreds them at a rate of 16 ft/min. Its large feed opening of 9” allows 99Ms to handle all kinds of documents that are common in an office environment. With its cut size of 5/64” x 9/16”, the Fellowes 99Ms achieves the security level of P-5, making sure that your classified information remains safe. The paper shredder is also equipped with a waste bin of 9 gallons that can be easily accessed from the front cabinet for shred removal. To prevent paper jams from taking place the Fellowes Powershred 99Ms Micro Cut Shredder comes with an auto reverse feature that initiates in case of a paper jam. For the safety of its users, the shredder comes equipped with Safe Sense technology that stops the shredder when the feed opening comes in contact with the user. This significantly reduces the chance of any kind of operational accidents from happening. The patented ultra quiet feature of Fellowes 99Ms operates the machine on the lowest sound levels, making this shredder an ideal choice for any office as it allows the user to carry on the shredding operation without any disturbances. The paper shredder also features an energy saving system that reduces power consumption by turning the shredder off after 2 minutes of inactivity, making the paper shredder economical and environment friendly. The Fellowes Powershred 99Ms Micro Cut Shredder is an ideal shredder to be use at the office and performs powerfully an effective shredding function. The Fellowes Powershred 99Ms Micro Cut Shredder is equipped with the waste bin of 9 gallons capacity, to access the Fellowes Powershred 99Ms Micro Cut Shredder’s waste after the shredding operation can easily remove the shred from the front cabinet of shredder. 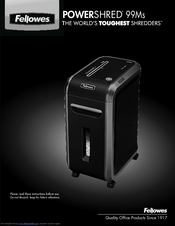 The Fellowes Powershred 99Ms Micro Cut Shredder has a safe sense technology feature. This feature of Fellowes Powershred 99Ms Micro Cut Shredder unable the shredder to stops the shredding operation immediately if hands comes in contact with the feed opening. The Fellowes Powershred 99Ms Micro Cut Shredder also equipped with the energy saving feature which unable to Fellowes Powershred 99Ms Micro Cut Shredder to consume much power by turning off after only 2 minutes of inactivity making the Fellowes Powershred 99Ms Micro Cut Shredder an economical and user friendly product.